Hardware as a service? According to data from Parks Associates, households are willing to pay monthly for professionals to service smart thermostats. Are smart thermostats the next subsidized security business model? Yes, according to new data from Parks Associates, which reports more than 50 percent of U.S. broadband households would be willing to pay $5 per month for a smart thermostat service that includes setup, installation, and repair/upgrades. Parks tested multiple hardware-as-a-service scenarios in its 360 View: Energy Management, Smart Home, & Energy Providers report, and found that while consumers are generally averse to monthly fees, they are willing to pay for services with clear value that include tasks they cannot or do not want to perform on their own. "Many in the smart home industry want to shift business models from a product to a service business model," says Tom Kerber, director, IoT strategy, Parks Associates. "For this approach to succeed, companies need to frame their services correctly. Households with a smart thermostat paid on average $177 for the device, so a service model at the right monthly price would be very attractive to consumers. They value features such as repairs, preventive maintenance, and tech support when considering these services." "Many in the smart home industry want to shift business models from a product to a service business model." Parks Associates reports more than 50 percent of U.S. broadband households are interested in hardware-as-a-service options for smart home kits, HVAC systems, and solar panels, when presented with a lower price point. Energy and service providers can use the energy data from these services to build additional value-added services, including real-time energy management services. "Sixty-four percent of U.S. broadband households value the ability to check their home's energy usage in real time," Kerber says. "Identifying when an appliance is operating less efficiently is also a big opportunity. Many U.S. consumers desire new solutions for these energy services, and hardware-as-a-service models create many bundling options built on energy data in the home." The report quantifies the thermostat and lighting markets, identifies major channels for each product, and profiles owners and those likely to purchase. It also examines consumer preferences for bundling energy products, services, and recurring revenue models. 56 percent of U.S. broadband households believe it is very important to have an energy-efficient home, but only 9 percent think their home is very energy efficient. 13 percent of U.S. broadband households own a smart thermostat, and approximately 60 percent were self-installed. More than 15 percent of U.S. broadband households own a back-up power generator. 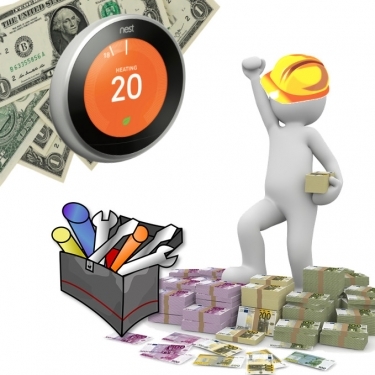 So could smart thermostats become the next source of recurring monthly revenue (RMR) for integrators?